The magic limit is exceeded: over 1 million hair transplantations were performed in the span of one year. Almost 85 percent of all treatments were on men, half of whom were between 30 and 49 years old. Vienna/Illinois (USA), 7 December 2015. 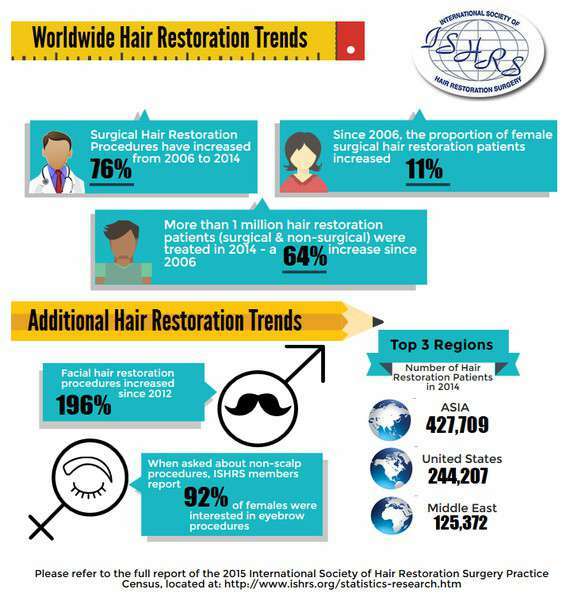 The world's leading organisation for hair transplantation (ISHRS), of which Moser Medical is a member, released the latest edition of its annual report. In short, hair transplants are in demand like never before. 1 million treatments were performed in 2014, the first time that number had been reached in the span of one year. Since 2006 there has been a 76% increase in the number of treatments worldwide (57% in Europe). Outside of the USA, most treatments take place in Asia. The main target group is men between the ages of 30 and 49, although the proportion of women has been growing steadily over the last ten years. In addition to the transplantation of hair on the head (forehead, receding hairline, tonsure), beard hair transplantation has been gaining interest. In only two years (2012-2014), the share increased by 92%. For women, eyebrow hair transplantation has gained in popularity. This procedure has seen a 92% growth in just two years. It is remarkable to note that, among qualified providers, so-called "mega sessions" are the exception. In around 42% of treatments, 1,000-2,000 grafts were transplanted and in 46% of treatments, 2,000-3,000. Smaller treatments provide a natural densification of the hair and help to ensure that donor hair is still present for any subsequent treatment (e.g., after 10 years). To achieve the best results, hair transplants require one thing above all: experience. So, it comes as no surprise that in the past two years, only 7% of treatments were performed by new providers, and that 30% of all hair specialists have been practicing for 15 years or more. But only very, very few providers have over 36 years of experience specialising in hair transplantation. Only those like Moser Medical.